Home | Coleford Tourist Information and pictures of Coleford, Gloucestershire, England. Coleford is a small market town in Gloucestershire, England. The town stands some four miles east of the Welsh / English border, and close to the Wye Valley and the Forest of Dean. Today, due to its prime location in the heart of the Forest, it is popular with walkers and cyclists, and has an ever growing tourist industry. The Coleford Great Western Railway Museum was founded in 1988. Based in the former GWR Goods Shed along the Coleford Railway, this listed building, built in 1883, is the last surviving part of Coleford Station, which once connected the town with Monmouth and Lydney. The collection covers the history of the railways in the Forest of Dean, dating from 1809 when the first Act of Parliament allowing a railway in Britain was passed, through the 19th century and the building of the Severn & Wye and Great Western branches connecting Coleford with Lydney (to the south) and Monmouth (to the north) respectively, and the Severn Railway Bridge (once the longest in England). The collection includes photographs and documents (many dating from the Victorian era), railway artefacts such as signs, signalling equipment, tools and locomotive fittings, a restored signal box, full-sized railway vehicles including a restored steam locomotive, and a 7.25" gauge miniature railway with steam and electric locomotives. The 19th Century Clock tower is a landmark in the Market Place, all that remains of the original old church that was demolished in 1882. There is plenty for all the family on a steam train day out at Perrygrove – not just a steam train ride but lots of other ideas for the kids including treehouses, under-cover play, and wonderful woodland to explore. There are an abundance of walks to choose from in the Coleford area. From the Wye Valley and Symonds Yat in the west, to the beautiful forest walks in the centre of the Forest of Dean. The centre of Coleford has been designated as a Conservation Area and there are a number of themed walks around the town itself that visit the numerous buildings of historic interest. Cyclists are well catered for with both Family Friendly trails and tracks for the more experienced Mountain Bike fraternity. The Forest of Dean 11 mile Family Cycle Trail follows the Dean's fully surfaced disused rail network. Six fun cycle features can be found on the loop to provide an enjoyable and exciting experience. There are links from the main trail to Lydbrook, Coleford, Cinderford and Parkend via well-maintained tracks. This route has been especially surfaced and is suitable for all ages and abilities. The trail takes you along the old Severn and Wye railway line, passing former stations at Drybrook Road, Cannop Wharf and Speech House. Remnants of former coalmines can be seen at Foxes Bridge, Lightmoor and New fancy. 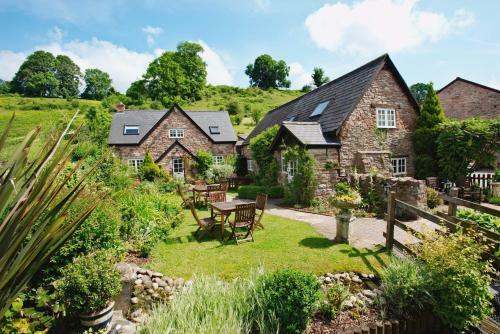 You may make an instant secure hotel or cottage reservation close to Coleford. Hotel and cottage availability and letting rates are confirmed online prior to booking. Simply click through to the accommodation page, choose a suitable property, check availability, including dates of stay, to confirm the exact room rate and reserve the accommodation.